Be Green teamed up with Sol Food Kitchen this Earth Day to bring totally sustainable meals to the events attendees. Organic, local cuisine provided by Sol Food was served on Be Green’s beautiful compostable bowls and plates (check out Sol Food’s menu below– it will make your mouth water!). Be Green would like to extend a big thank you to the Organic Soup Kitchen of Santa Barbara for providing healthy, nourishing meals to the local homeless population this Easter Eve! In support of the event Be Green donated compostable bowls, cups, and trays. Check out the Organic Soup Kitchen website to learn how you can get involved in upcoming events. Inhabitat is partnering with MBDC to give away four fabulous prizes during Earh Week. 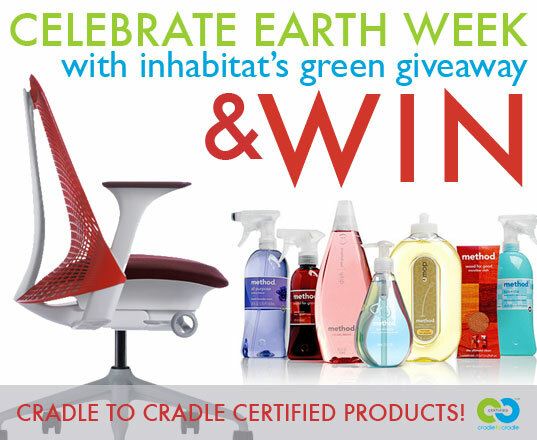 Each winner will receive a Cradle to Cradle certified product and a copy of the book Cradle to Cradle. Go to www.inhabitat.com and click on the daily blog post to enter the giveaway. 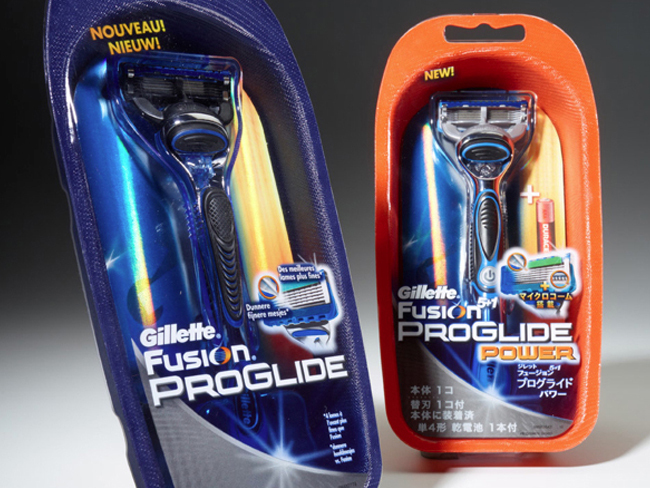 The launch of Procter & Gamble’s new Gillette® Fusion® ProGlide™ Power Razor represents a first in the packaging industry and an exciting new direction for Burgopak USA. The partnership between Burgopak and Be Green Packaging–a molded-fiber company based out of Santa Barbara–has us all looking forward, and this first successful collaboration is a landmark. The significance of Procter & Gamble’s involvement as the largest consumer packaged goods company in the world cannot be understated. Aligning with Procter & Gamble’s new long-term goals in environmental sustainability, the package redesign utilizes Be Green’s fiber-based material. The pack was a huge win in package reduction, resulting in a 79% reduction in plastics, a 17% reduction in gross weight, and a 16% improvement in pallet density; all of which was achieved without any cost increase or detriment to the aesthetics of the pack. Burgopak has worked with Procter & Gamble on a range of structural design projects for their leading consumer brands including The Art Of Shaving and ZIRH. The new Gillette Fusion ProGlide launched globally on January 25th, 2011. 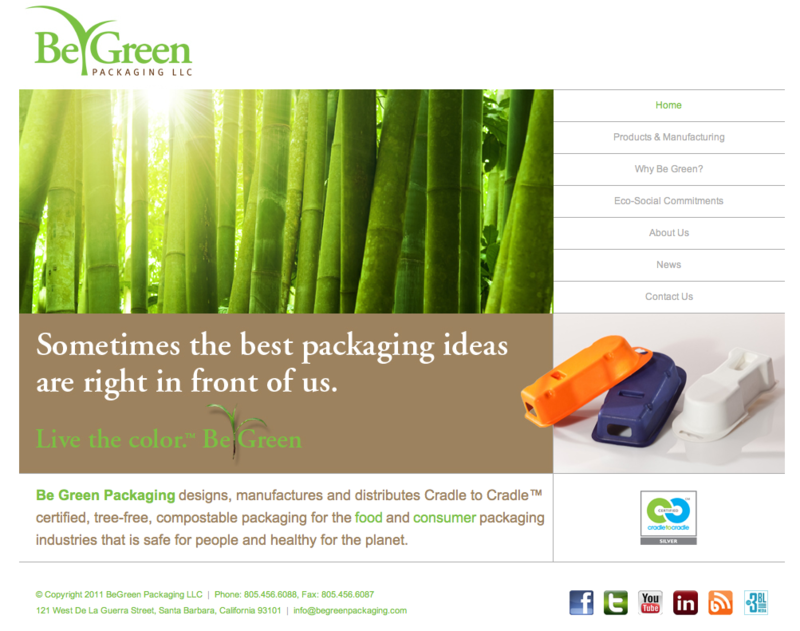 Santa Barbara, CA – April 11, 2011 – Be Green Packaging, now a California and South Carolina based company, is proud to announce the launch of their new website. After many months of strategic collaboration with LA based design and marketing company, FreeAssociates, they believe that they have built a website that embodies the personality and character of their brand. Be Green feels the website better positions them in the current sustainable packaging industry. Equipped with a new consumer packaging page, the site exemplifies Be Green’s proficiency in the custom consumer packaging industry. Be Green’s breakthrough technologies have given them the ability to create custom packaging designed to a client’s specifications. Their process allows them mold rapidly renewable fibers with impeccable precision and quality. Be Green takes great pride in their commitment to a whole system packaging operation and in the transparency through which they conduct their entire business. Amid the surge of greenwashing, Be Green wants their customers to be sure that the products they manufacture are truly environmentally friendly. Their new website provides this assurance by detailing Be Green’s environmental and social memberships, affiliations, and third party certifications and testing. “The new website is more usable, accessible and educational and it also provides an improved outlet for our customers to interface with us,” said Shala Kiewert, Senior Administrative Vice President at Be Green. Overall, Be Green hopes the strategic design will assist Be Green in achieving their environmental, social, and economic goals. COLUMBIA, S.C. – April 8, 2011 – Gov. Nikki Haley, the South Carolina Department of Commerce and the Lowcountry Economic Alliance today announced that Be Green Packaging LLC, a manufacturer of “green” packaging, will locate its new manufacturing and distribution facility in Jasper County. The company plans to invest at least $7.3 million and expects to generate at least 175 new jobs over the next five years, with the potential of more jobs and investment added during that time. Be Green Packaging, a fast-growing green packaging business, will locate its new manufacturing and distribution facility in Jasper County in an existing building located at 4427 Grays Highway in Ridgeland, S.C. The company will manufacture and distribute consumer, industrial and food-grade packaging from this new plant. “What makes this great is that we said we weren’t going to just focus our economic development and job creation efforts on the cities but also the rural areas that need it the most. Be Green Packaging’s decision to invest more than $7.3 million and create 175 new jobs in our state is exciting news. We’re working every day to make our state the most competitive in the country for business development so that we will continue to see investments like this one,” said Gov. Nikki Haley. “Green jobs and industry is more than a ‘slogan.’ Green jobs are jobs that help protect ecosystems and assist in biodiversity, reduce energy and water consumption, minimize waste and pay living wages and provide healthcare benefits for its workforce. Be Green Packaging felt this region and especially South Carolina, which has a long and rich tradition in the paper and pulping industries would be ideal for this 21st century business. The people of this state have the heritage, backgrounds and experience that will provide our company with the skills and resources for producing products made from sustainable plant fibers. The local agricultural community will benefit from Be Green as the crops and byproducts they grow in this region will be used as feedstock in our packaging material,” said Ron Blitzer, co-founder and CEO of Be Green Packaging. Be Green Packaging has been manufacturing in China since 2006 and distributing from one of its Boston warehouses. The additional capacity of products made in the U.S. will further support the company’s U.S. and global customer base, which includes: Whole Foods Market, P&G’s (Gillette Razor Company) 7-11 and South Carolina-based Sonoco’s facility in Poland. The company will continue to manufacture in China to its ever-rapid expansion in support of its global demand. The Port of Charleston can anticipate increased container traffic as Be Green shifts imports of containers from Boston and New York to South Carolina for distribution throughout the U.S., according to the company.